Two miles south west of Port Askaig, a well signposted single track road heads north for a mile to Finlaggan. Here you find a car park outside the excellent Finlaggan Visitor Centre, while off to one side a gate gives access to a track that descends over fields to a wooden walkway leading to Eilean Mor, an island in Loch Finlaggan, on which you find the remains of a number of buildings. A second, inaccessible, island stands a little beyond the first. 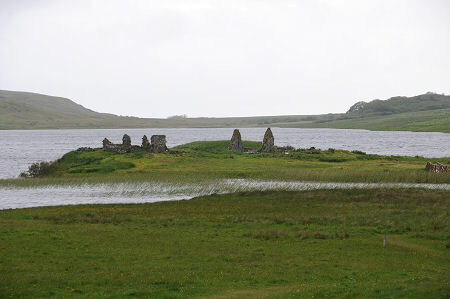 Finlaggan is an enormously important place in the history of the Highlands and Islands of Scotland. During most of the 1300s and 1400s it formed the administrative centre of the Lordship of the Isles, which during this period governed a large part of the western seaboard of Scotland. The Lords of the Isles nominally governed on behalf of the Scottish Crown, but in practice exercised considerable independence: a state of affairs that came to a halt 1493 when the 4th (and final) Lord of the Isles, John MacDonald II had his titles stripped from him by King James III. The origins of settlement on and around Loch Finlaggan appear to date back to the iron age. In the first half of the 600s a monastic community was established on Eilean Mor, the larger of the islands in the loch. 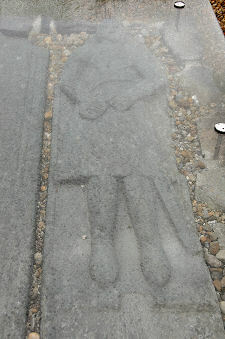 This was either dedicated to, or just possibly founded by, St Findlugan, an Irish monk and a contemporary of St Columba. From the early 800s onwards, the Hebrides came under the increasing influence of the Norse. It was only in 1158 that they were ousted (and then not for good), by Somerled, who had been born of mixed Norse and Gaelic parentage. He was able to declare himself King of Man and King of the Isles and came close to establishing a separate kingdom, independent of both Norway and Scotland. This effectively ended when Somerled, was killed in 1164 by the forces of Malcolm IV. One of his sons, Angus Mor Mac Donald, founded Clan MacDonald and was appointed Lord of Islay by the Norwegian King Håkon IV. Four generations later, in the middle decades of the 1300s, one of Angus's descendents, John of Islay, managed to gain control over much of the area previously ruled by Somerled. He did so, however, not as a king, but as the self-styled "Lord of the Isles", nominally paying homage to the Scottish Crown: and he cemented his links with that Crown by marrying the daughter of King Robert II. It seems possible that it was John of Islay, the 1st Lord of the Isles, who established a settlement on the two islands at the northern end of Loch Finlaggan, the larger Eilean Mor (or "big island") and the smaller Eilean na Comhairle (or "council island"), though it may have been one of his predecessors as Lord of Islay. Why a lord governing a realm dependant on naval power should have chosen some islands on an inland loch to govern it from is not immediately obvious. The answer may lie in the historical memory of St Findlugan's Monastery on Eilean Mor, which was perhaps believed to mark it out as a special place. And Finlaggan, as it became known, was not that far from the head of Loch Indall. Here the lord's birlinns, the fighting ships of the time, descended from Viking longships, could be pulled up on the beach. Whatever the reason, the two islands came to support to a thriving and bustling community. Eilean na Comhairle, whose origins date back to a broch built in the loch in the iron age, became home to a stone castle. This was served by jetties, but was also linked by a causeway to the larger Eilean Mor. Here there was a great hall, a chapel (possibly on the site of the monastery founded six centuries earlier) and other accommodation, plus ranges of service buildings of the sort usually associated with a lordly residence. The ruin of the chapel stills stands on Eilean Mor, but other remains on the island largely date back to a homestead which existed here in the 1600s. 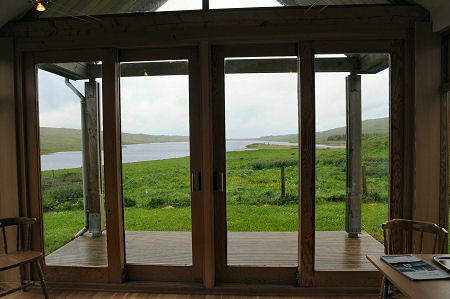 There are two distinct elements to any visit to Finlaggan. The superb visitor centre is open seasonally (see links on right) and offers a well thought out insight into the world of the Lords of the Isles and a home to many of the impressive and beautiful artefacts which have been unearthed at Finlaggan during archaeological investigation in recent decades. Here you can find the head of a beautifully carved cross. 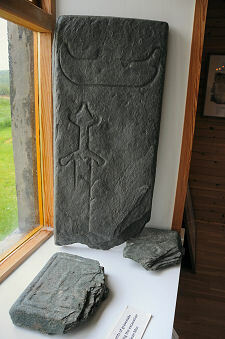 Elsewhere there is part of a grave slab with very clear carvings of a sword and a birlinn. One end of the centre is home to a tableau of Donald, 2nd Lord of the Isles signing a charter which has survived to this day. 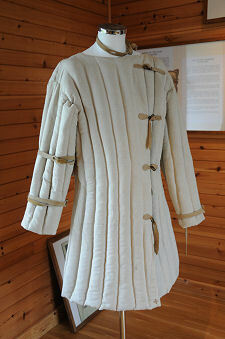 Here, too, is a full size padded tunic or aketon, intended to provide the wearer with some protection in combat, or be worn under armour. There are some extremely nice touched in the visitor centre. The reception desk, for example, is in the form of a longship. And one window sill supports a model of Eilean Mor in a position that allows a direct comparison to be made between the model and the view of the island through the window. Eilean Mor itself is open at any time. We approached it with great expectations, but found that for us it didn't quite live up to them. There is no shortage of interpretation boards showing you what you are looking at, but perhaps the overlay of later buildings on the island detracts from the sense of it having been so closely tied with the Lords of the Isles. For us the main disappointment was the way a nice collection of medieval grave slabs has been displayed in the remains of the chapel. The slabs are laid flat and protected from the elements by clear covers: which means that your chance of actually seeing the detail is lost in reflections of the sky. As the grave slabs don't appear to be in their original locations, it might have been better for them to be displayed leaning against a wall, under a small shelter protecting them from the elements, as tends to be done at sites in the care of Historic Environment Scotland. Ballygrant, Isle of Islay, PA45 7QL.